Numerous statewide polls have suggested voters would approve a minimum wage proposal—perhaps even a more sweeping version—if given the chance. 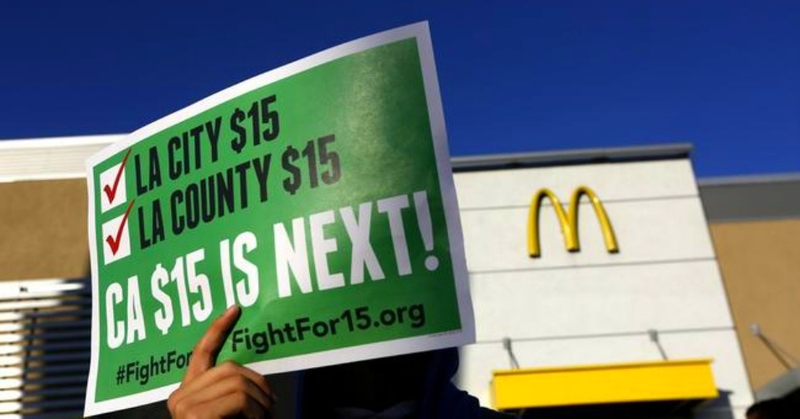 Hoping to avoid a costly ballot fight, California lawmakers and labor unions on Saturday reportedly reached an agreement to raise the state minimum wage to $15 an hour gradually by 2023. Governor Jerry Brown is expected to make a formal announcement on Monday, but a source close to the negotiations revealed the content of the deal to the Los Angeles Times two days ahead. “According to a document obtained by The Times, the negotiated deal would boost California’s statewide minimum wage from $10 an hour to $10.50 on Jan. 1, 2017, with a 50-cent increase in 2018 and then $1-per-year increases through 2022. Businesses with fewer than 25 employees would have an extra year to comply, delaying their workers receiving a $15 hourly wage until 2023,” the Times reports. A minimum wage initiative that would have raised the wage to $15 by 2021, which was championed by SEIU United Healthcare Workers West, had recently qualified for the November ballot forcing state lawmakers to take swift action. According to the Times, business groups “were relegated to the sidelines” during the latest round of negotiations. “They had sought some kind of way to preempt the local wage ordinances through state legislation, but labor groups considered that kind of concession a non-starter,” the Times reports. 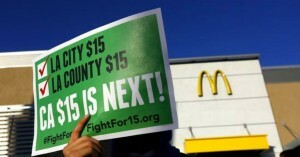 The new agreement will not override local efforts to boost wages at a more rapid pace. In May 2015, Los Angeles voted to raise the minimum wage to $15 an hour by 2020, becoming the largest city thus far to do so. And last summer, Emeryville raised the wage to $14.44, which, according to In These Times, is the highest blanket rate of any city in the nation. As of January 1, the current statewide minimum wage is $10 an hour.